Multipoint GRE works the same as a single GRE tunnel between two end-points, the only difference is that with mGRE we don’t have to specify the tunnel destination. NHRP is a protocol or the “Engine” when it comes to DMVPN deployment, so NHRP takes care of the mapping between the Hub and Spokes site dynamically. I have preconfigured EIGRP on all router interfaces (Hub-HQ, S1 and S2) except on the interfaces connecting to Public Network, but of course they still can’t advertise each other their networks because we still didnt create the mGRE tunnels. 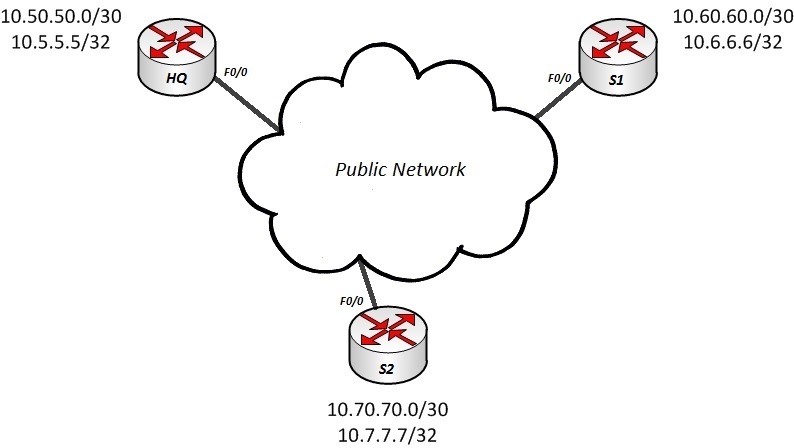 “ip nhrp map multicast dynamic” – this commands ensures that multicast traffic is allowed between the Hub and Spokes which is crucial because Routing Protocols such as OSPF, EIGRP, RIP use Multicast for their control plane functionality. “ip nhrp network-id 1” – this command defines the network identification, so all spokes that want to participate to this DMVPN network should have the same id. “tunnel source 15.1.1.1” – this command ensures that our Public IP is used as the source as long as it arrives to the other spokes when traffic is passing through the tunnel. “tunnel mode gre multipoint” – this command defines the tunnel as gre multipoint, so no need for static destination configuration because NHRP will take care of all the dynamic destinations coming in and out. “ip nhrp map 192.168.0.1 15.1.1.1” – This command maps the tunnel ip address of HQ router with the Public IP address of the same. “ip nhrp map multicast 15.1.1.1” – This command ensures that multicast traffic will be enabled to the HQ router which is our Hub site. “ip nhrp nhs 192.168.0.1” – This command configures the IP address of the Next Hop Server (HQ Router) which will be used always for every destination to other Spokes. Sure enough, hop 2 tells us clearly that this is the tunnel IP address of HQ. This DMVPN configuration example used only GRE encapsulation without any IPsec encryption, to add encryption we need to configure crypto maps so that the traffic cannot be intercepted somewhere in the Public Network. I need to start playing around with DMVPN more. Sure, it’s a very cool “feature”, and now part of CCIE R&S v5.0 as well.